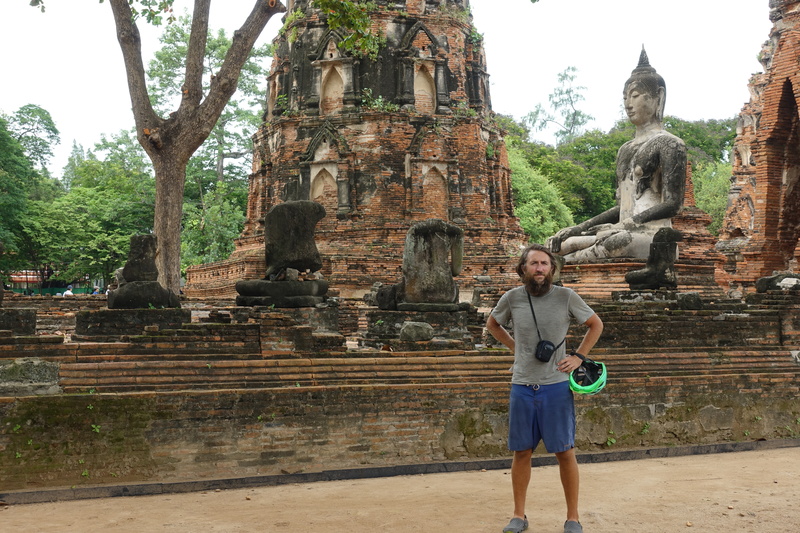 After a few days visiting Thailand’s capital, having our bicycle maintenance done and making sure that all our gears would be ready for the second half-year, we set off north towards our final destination in Thailand: Chiang Mai, about 1000km away. 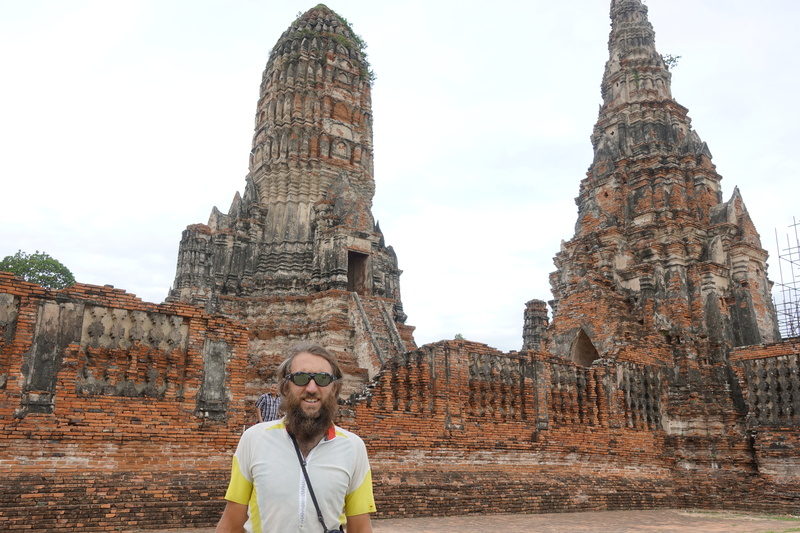 We left Bangkok taking a train across the suburbs and started our first day cycling again from Ayutthaya. 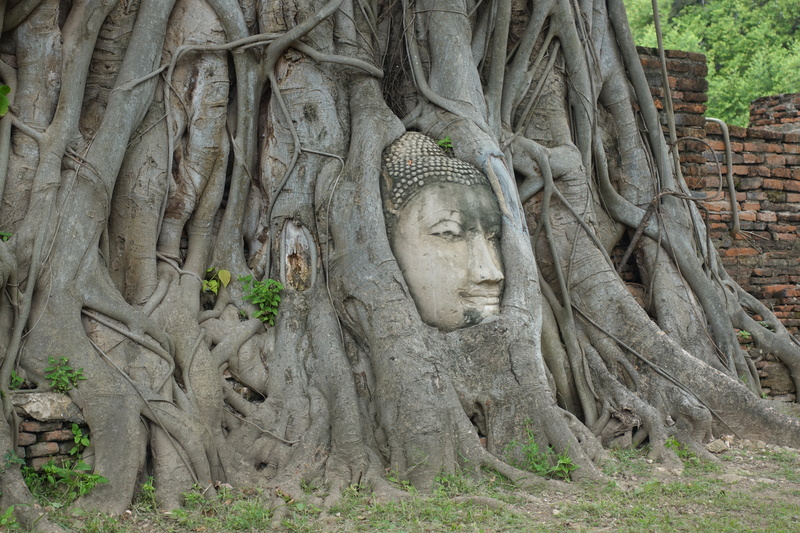 Ayutthaya was the former capital of the previous state that is now Thailand and was more or less abandoned after an attack by the Khmer state (the history of Burma, Siam and the Khmers – today Myanmar, Thailand and Cambodia – is a closely interrelated). 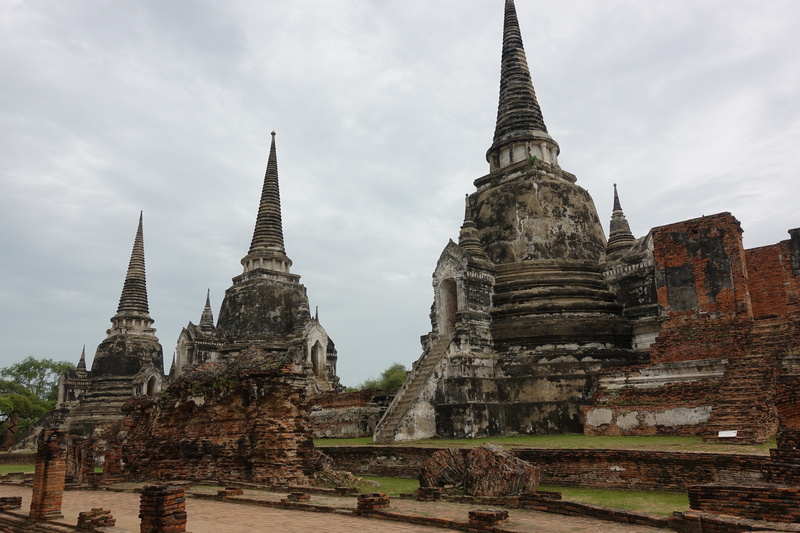 Even if Ayutthaya is still part of the greater metropolitan area is Bangkok, we got relieved to see a lot less traffic, a much quieter atmosphere and be back riding across rice fields! 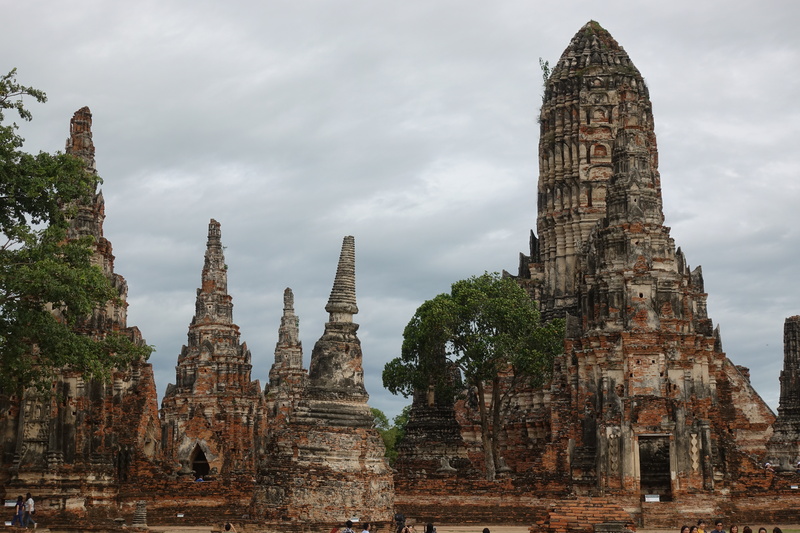 We visited the ruins of the tens of the temples spread out over a large area that was part of the old capital but now often outside of the rebuilt (and visibly still much smaller) Ayutthaya. 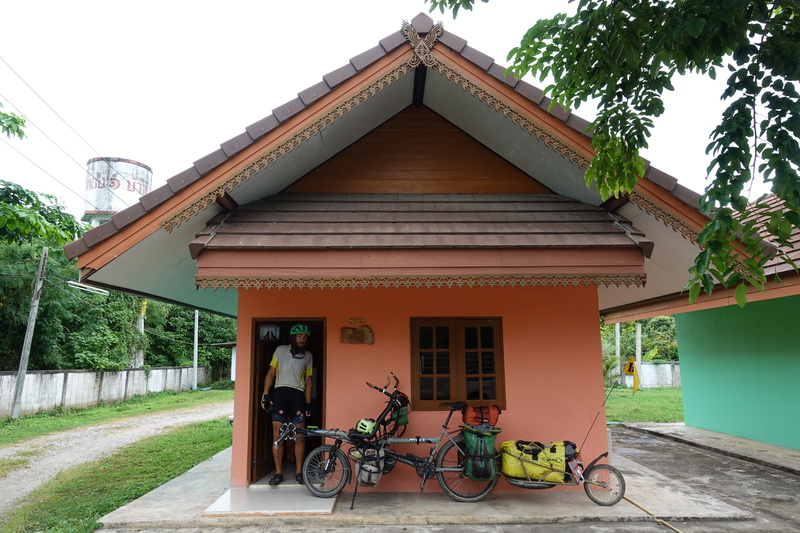 It was very enjoyable to be able to ride our tandem again from a site to another, and it reminded us a bit of Angkor-Wat (Siam Reap) in Cambodia, but with a lot less tourists and more manicured than in the neighboring country. 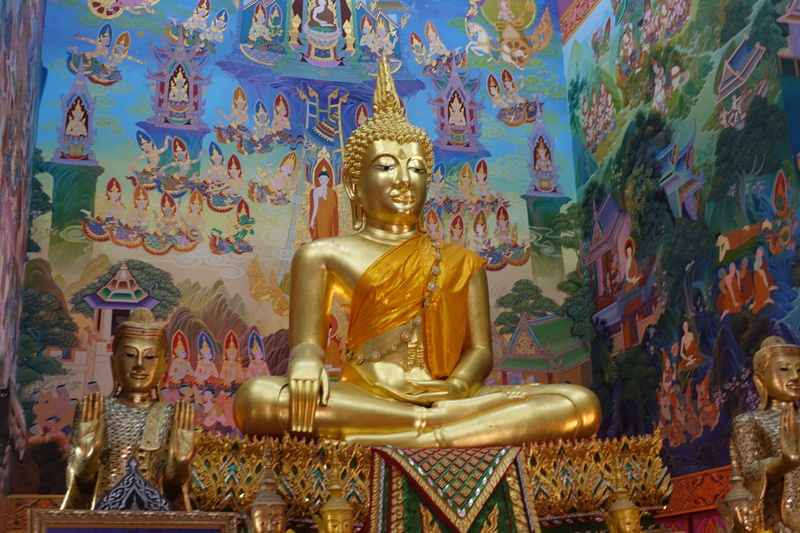 I (Cedric) however started to feel that something got a little wrong with my health in Bangkok after the first signs of strong tiredness and nausea. This would follow me for the next 2 weeks, not sure what kind of weird sickness that was, but no need to worry, after some internet-auto-diagnostic-auto-medication and some nurse-Ballert-advise, I am fully fit again and ready for cycling! 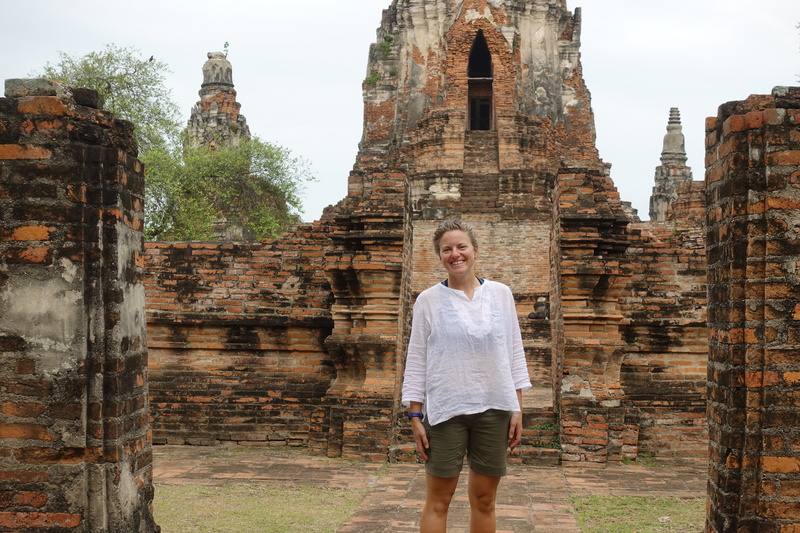 We spent an evening and afternoon to explore the old temples and left at noon towards the north and a first long day cycling towards Sing Buri. 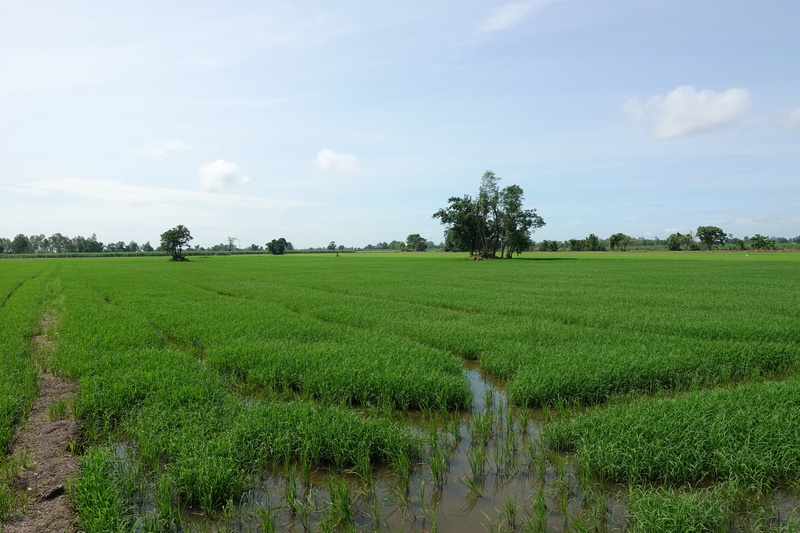 The flat plains in Central Thailand meant that we were still able to cover a ‘normal’ day’s distance over just a few hours and we also had to make it to Chiang Mai at some point (although we tried to buy our flights out as late as possible). Along the way, in need of a bit of cold extra soda fuel to keep Cédric going, we stopped at a small shop and piqued the interest of a few local guys hanging out and drinking whiskey. 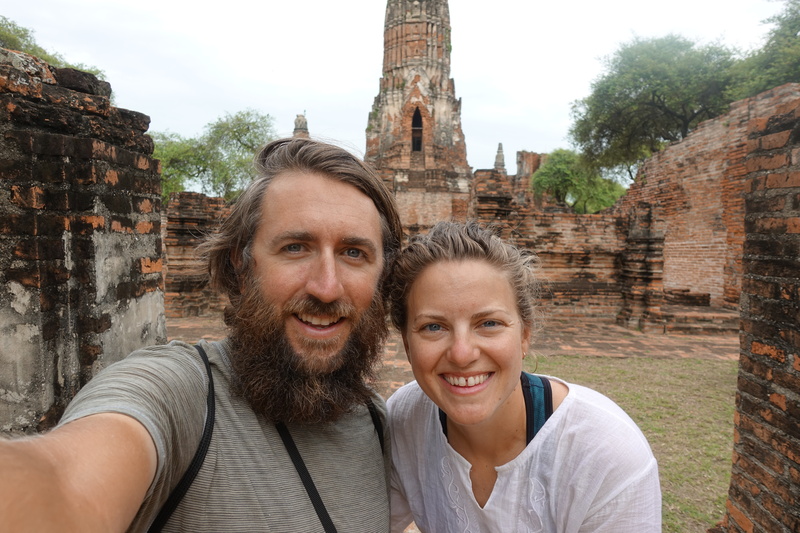 With them, we spent a few minutes conversing in gestures and taking selfies (by now, it’s easy to figure out what people are asking because everyone asks the same questions). 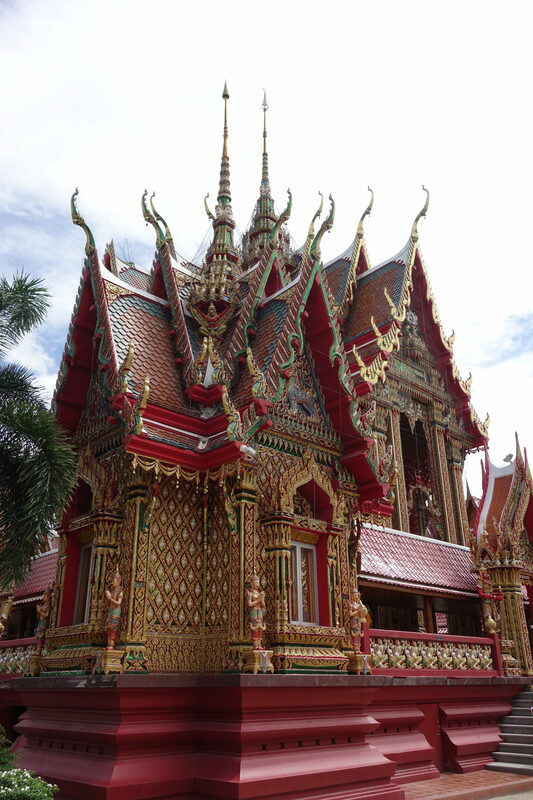 The next morning, we left Sing Buri and continued our course along the Chao Phraya river. 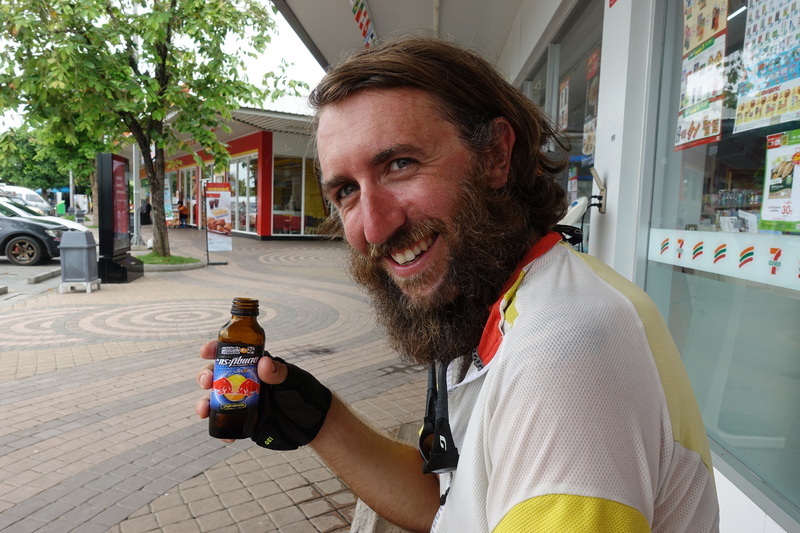 Due to Cédric’s wavering health, we made more than a few 7-Eleven stops for cold Coke and other energy packed food-bombs to keep him going throughout the day. 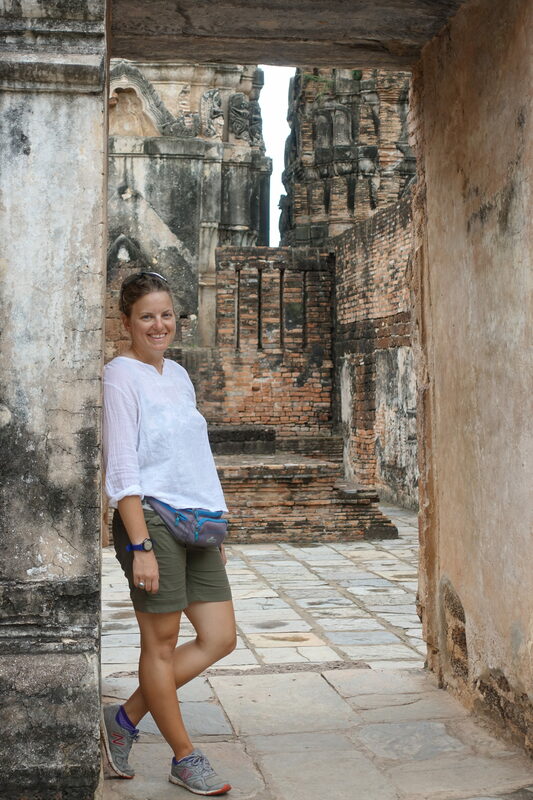 That also meant avoiding taking risks with some adventurous street food dishes (fried rice remained a safe bet). 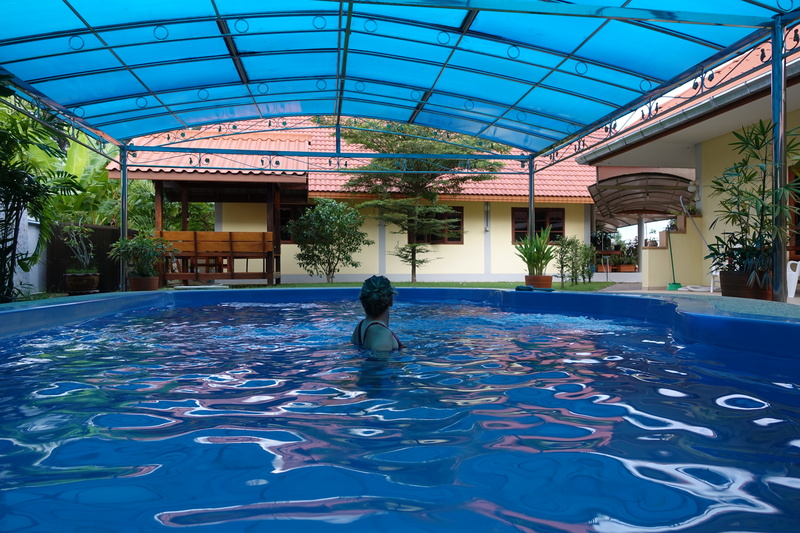 Starting that evening in Uthai Thani, we noticed that the monsoon season was catching up with us once again. 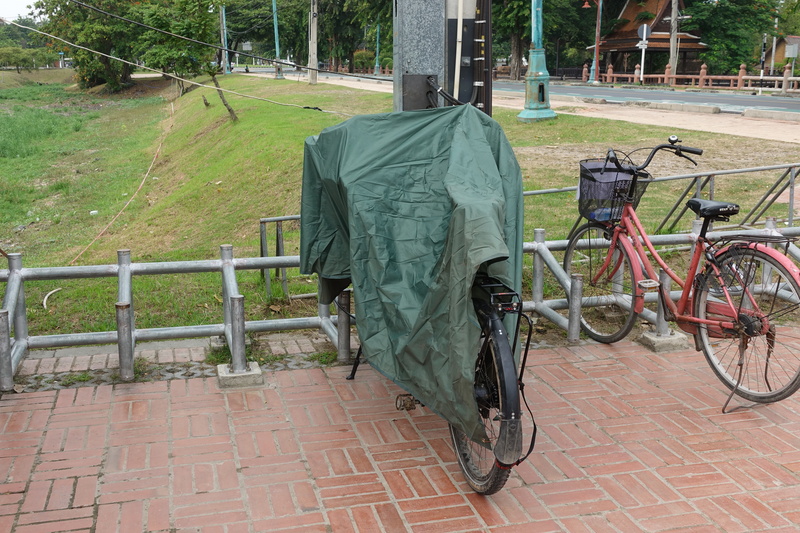 Instead of days of full sun like we had south of Bangkok, our days were now overcast, and strong showers began in the evening and throughout the night, but still fine for cycling as long as we were done by 4pm. 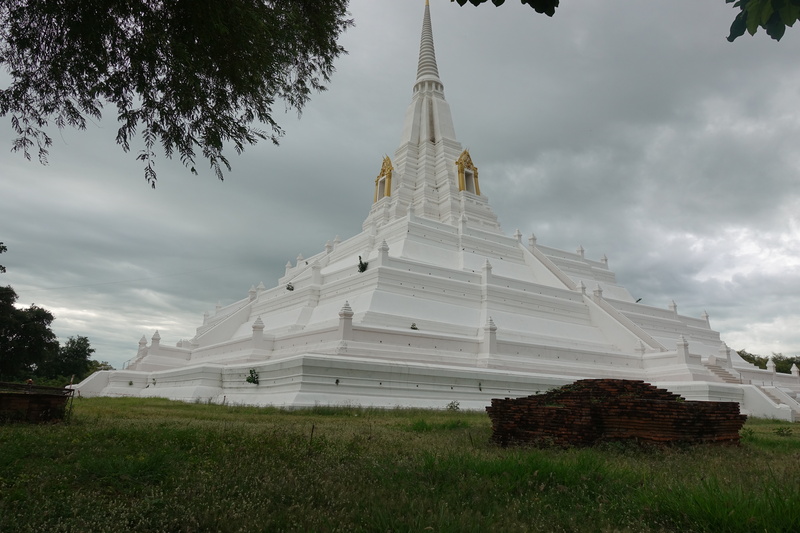 We managed yet to get to our hotel in Uthai Thani just before a heavy downpour. 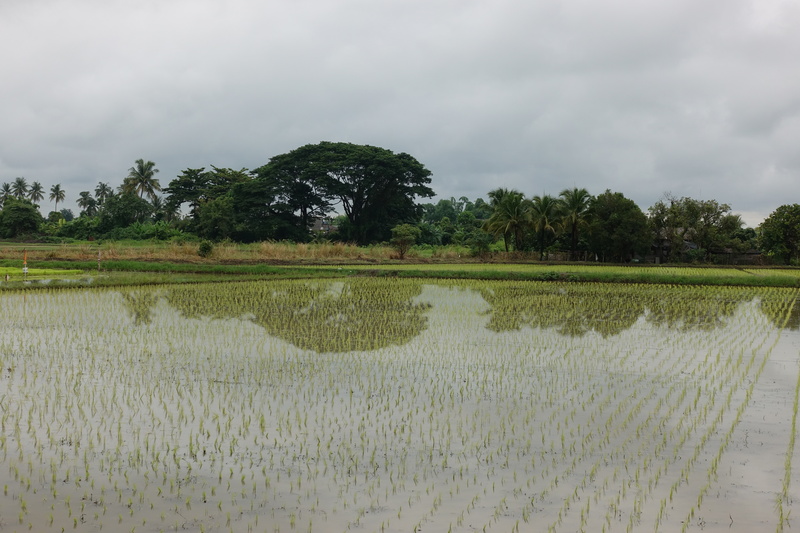 The beginning of the flat lands, our GPS took us through the most remote ways between the fields – we were sometimes really not sure if we would not have to push the bike in the mud, but the GPS was always right! 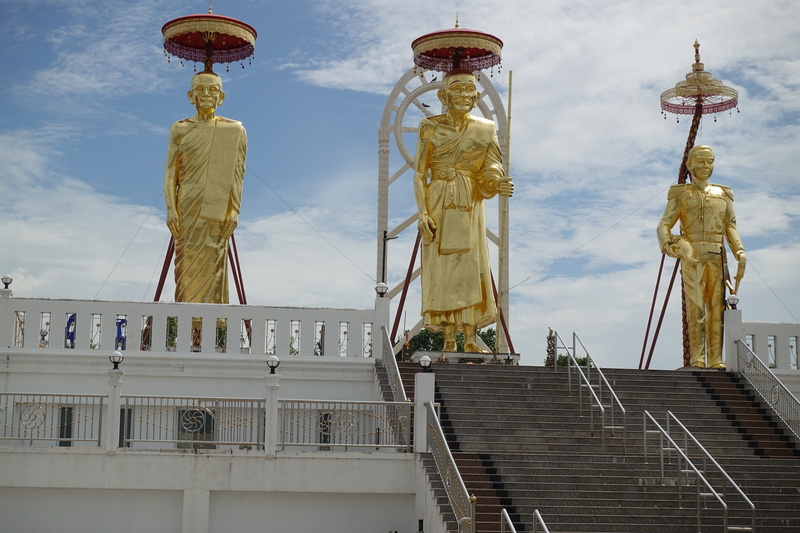 Not sure what those three old guys did in their lives, but they got some big shining statues of themselves! Yep, Cassie can see, no worries! Since Cédric wasn’t in the greatest condition (his day revolved around eating and drinking sugar, biking, and sleeping), Cassie continued cycling the next day steering in the back of the tandem despite her constant preoccupation with dogs (the idea of swapping positions was also to make sure that the healthier person could “transport” the less fit one- although both still need to pedal!). 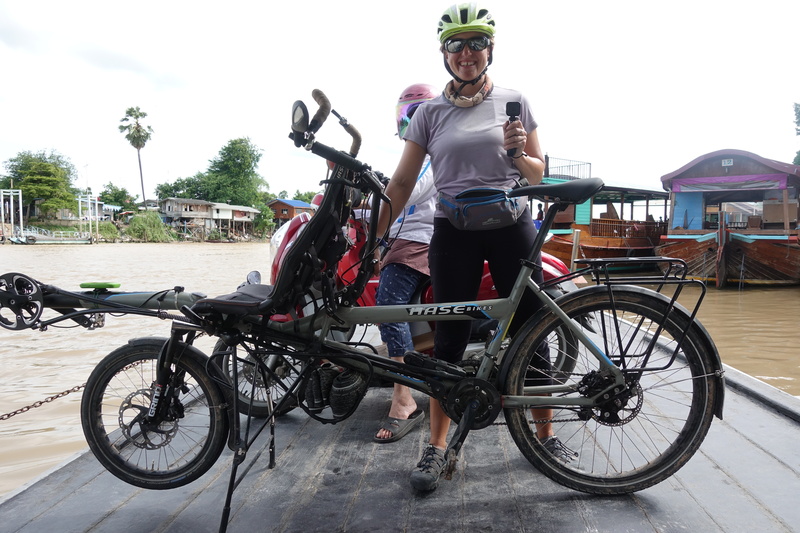 That day, we took a detour to Nakhon Sawan to attempt to fix our hydraulic brakes: they had not been fixed as well as we had hoped in Bangkok (still okay for flatlands in Thailand) but certainly not adequate for the upcoming trip on the edge of the Himalayas in Central Asia. Thankfully, there are many road cyclists, so a Shimano service store wasn’t difficult to find. Despite our explanations that there was probably some air in the hydraulic circuit, the shop was reluctant to fully bleed the tubes and just managed to improve slightly the breaking force by adding some oil. 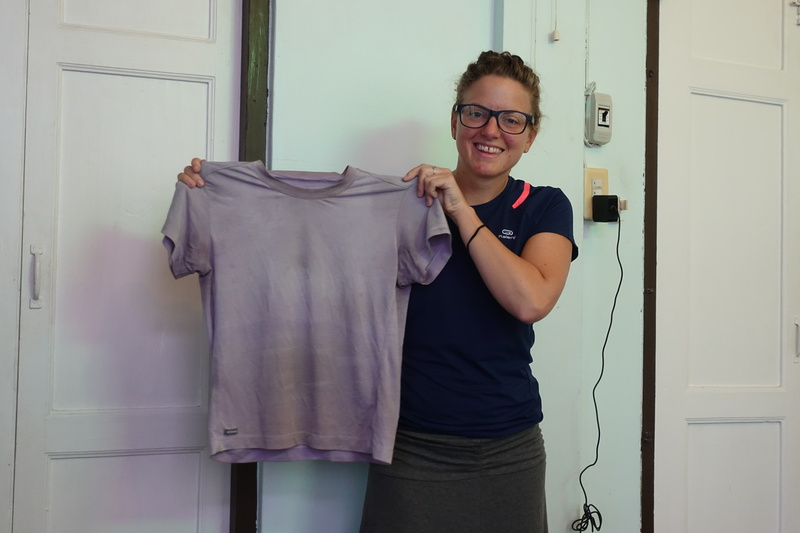 Luckily, we had the backup plan of a much more reliable shop in Chiang Mai that would do a cleaner job in a few weeks. 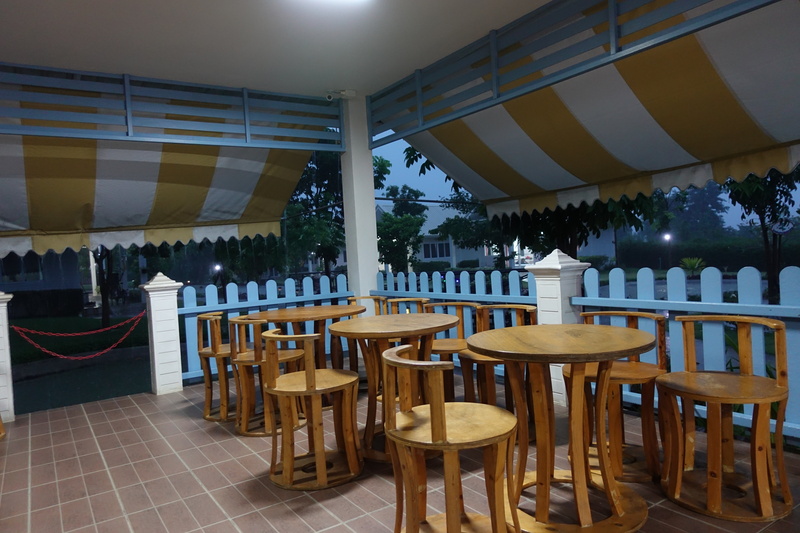 Leaving our friendly hotel in Uthai Thani, fully solar powered! 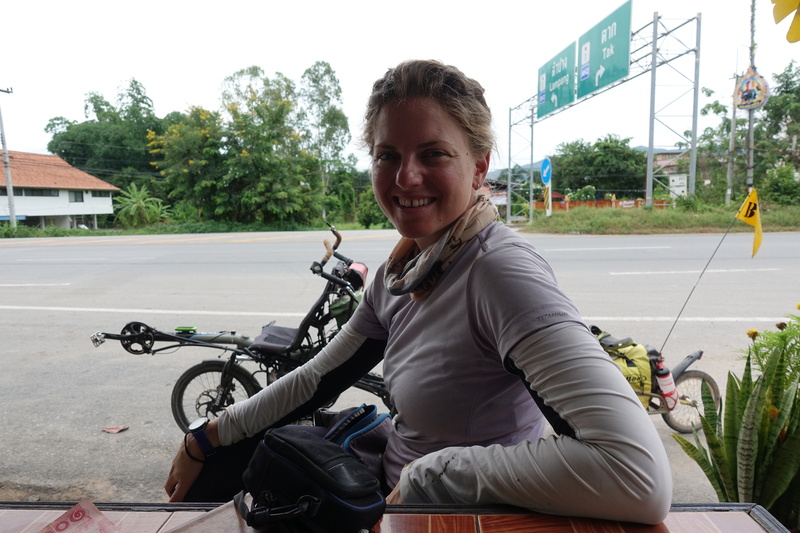 The day ended shortly afterwards, a few kilometers north of Nakhon Sawan with Cédric feeling worse than he did in the past few days, also not helped by Cassie ordering a beer instead of a tea at the restaurant for lunch (the beer brand “Chang” vs. the Chinese word “Cha” for tea), but because Cassie was steering, Cedric got to drink the beer… The weird virus sent Cedric into a long nap in the evening, shortly after followed by a night sleep disturbed by fever – we made the decision to stay two nights at the same hotel, so he could recover. 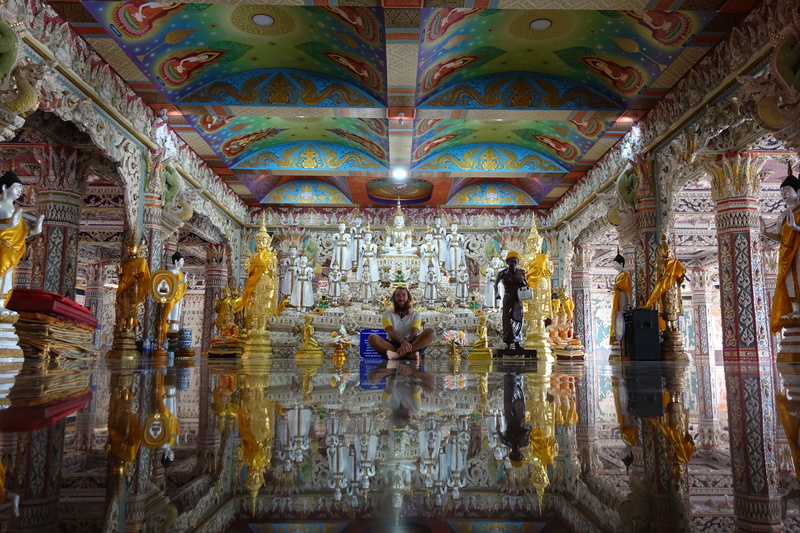 That night also got very interesting as we discovered the rituals of funeral ceremonies in Thailand: a very old lady passed away a few days before, but the tradition is that you should not be sad about it and keep on living (as explained by the hotel owner), so the family organized some sort of cremation-rave-party with Thai folk music blasted with the loudest possible speakers in the region, only a few hundred meters away, and starting at 4am! 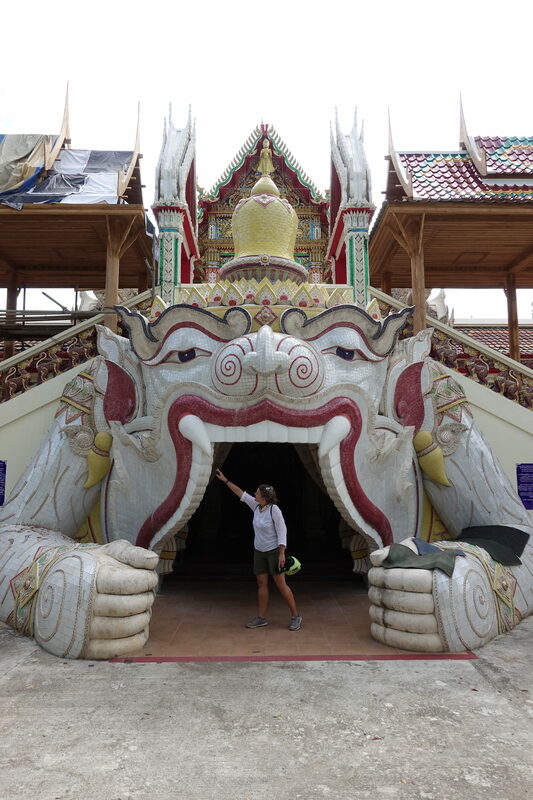 We did not try the same method as for the meth-druggies in NZ (although it was considered), and simply took our earplugs out, but even the hotel owner complained to the police during the night that it was a little too much. The police apparently simply replied that well, traditions are more important than the sleep of locals…not sure if the old lady would have enjoyed that music though! 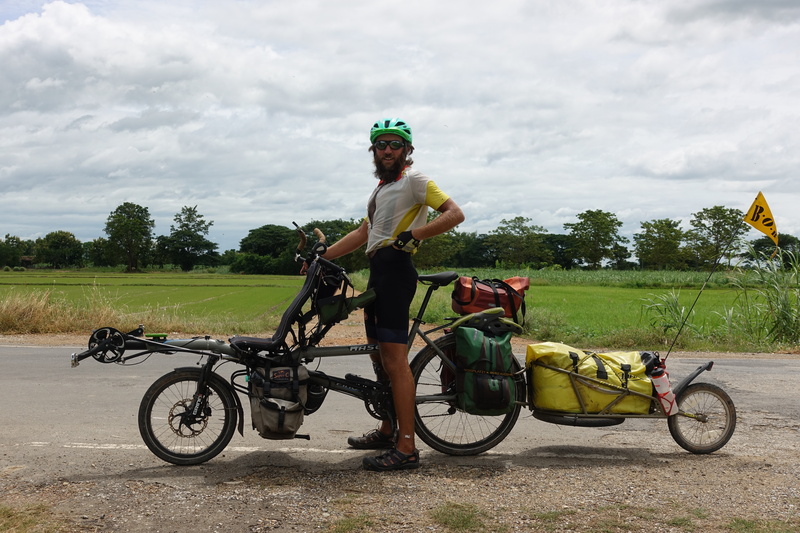 When Cédric was feeling more fit, we rode our tandem around a few temples and enjoyed the scenery of rice fields for a few kilometers in the afternoon. 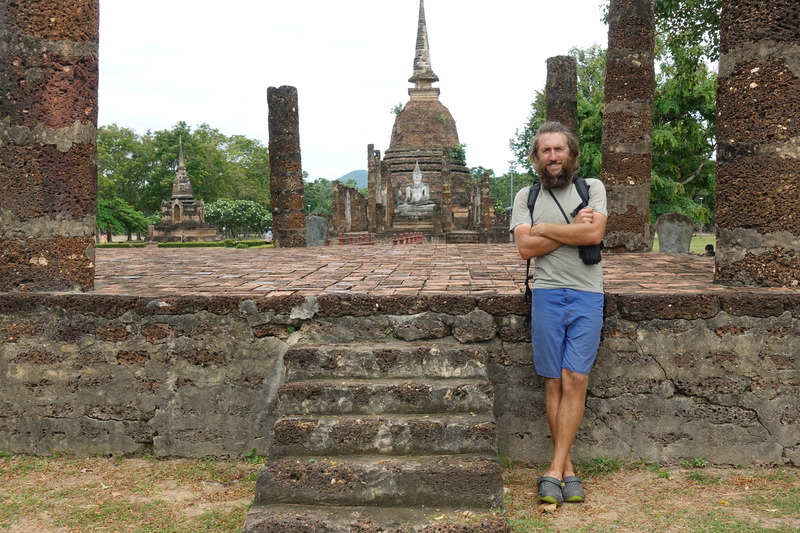 Since Cédric was feeling better, we set off for Sukhothai, another ruinous former capital within Thailand, this time sacked by the Burmese. 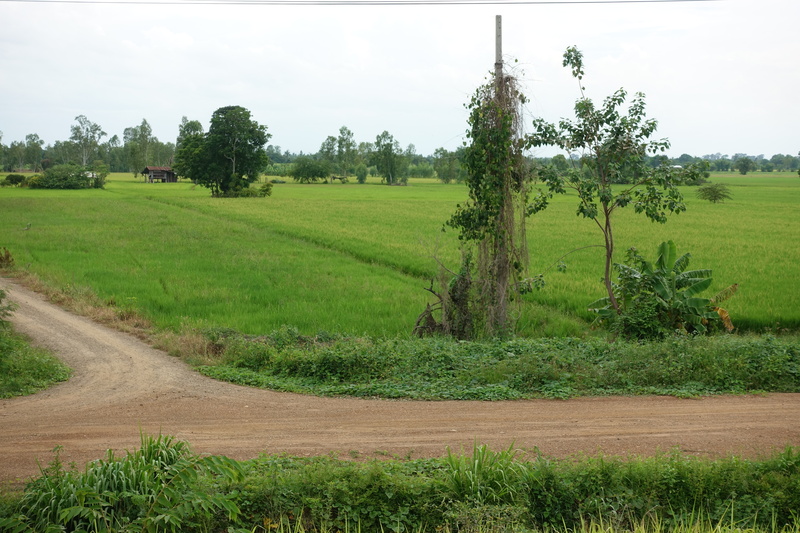 For the most direct route, our GPS took us through old roads deep in the rice paddies. 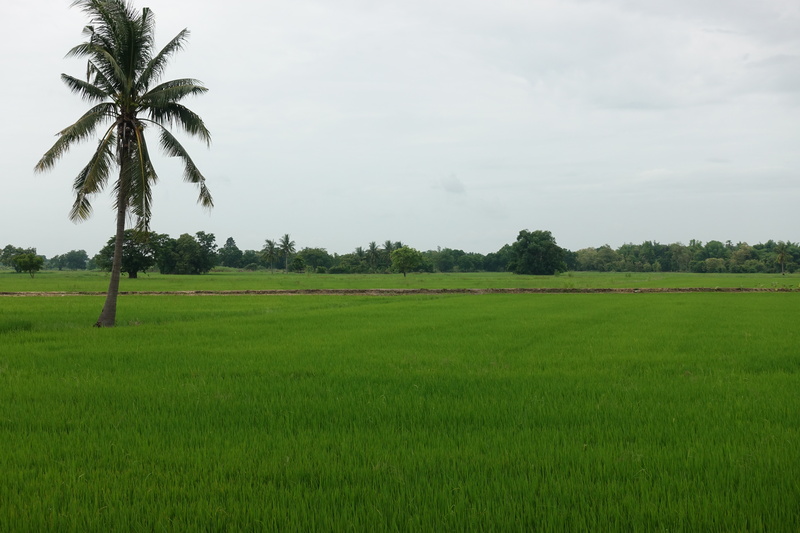 Although being a similar landscape for several days, that was a very enjoyable and scenic ride. 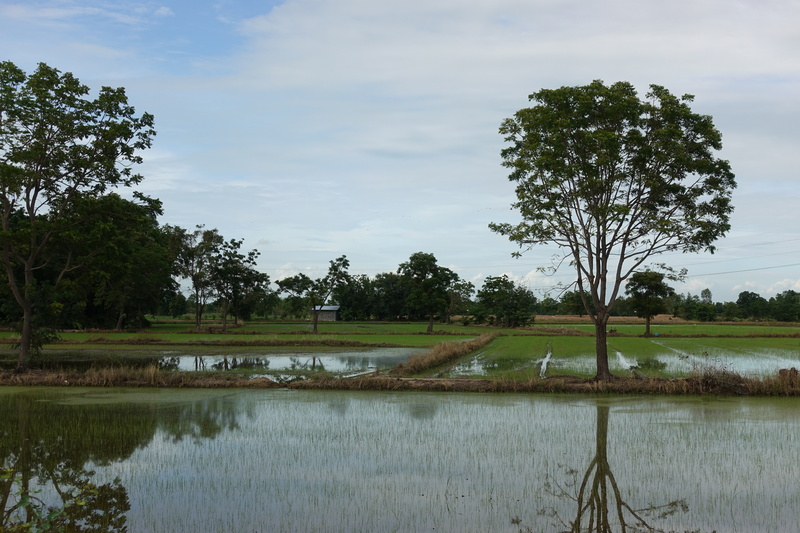 Our appearance would usually catch the attention of several rice farmers and we got many waves and smiles as we passed by. 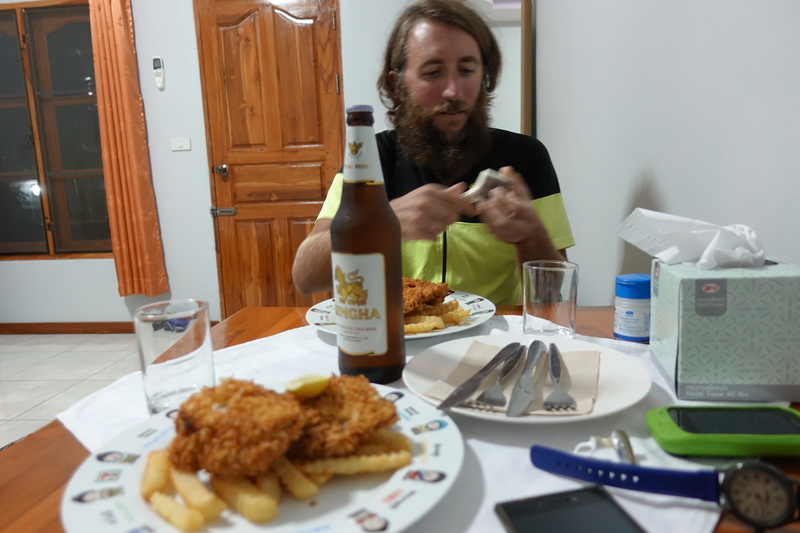 The hotel owner was Austrian and he made us some Schnitzel with beer – a great change after fried rice every single day! 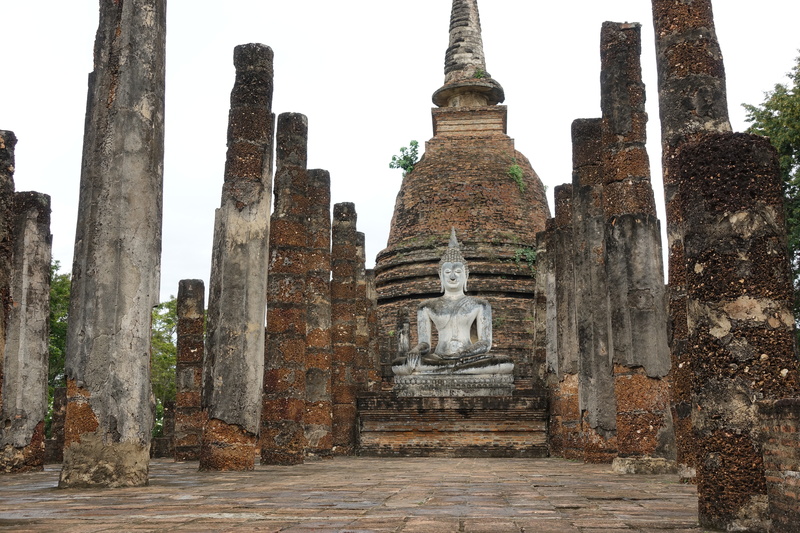 To try making things simpler to understand, Sukhothai was a long time ago capital of a state that would collapse, a state that would eventually get reborn and become larger but with then Ayuttaya for capital, before collapsing again and become even larger as today’s Thailand, with Bangkok for current capital. 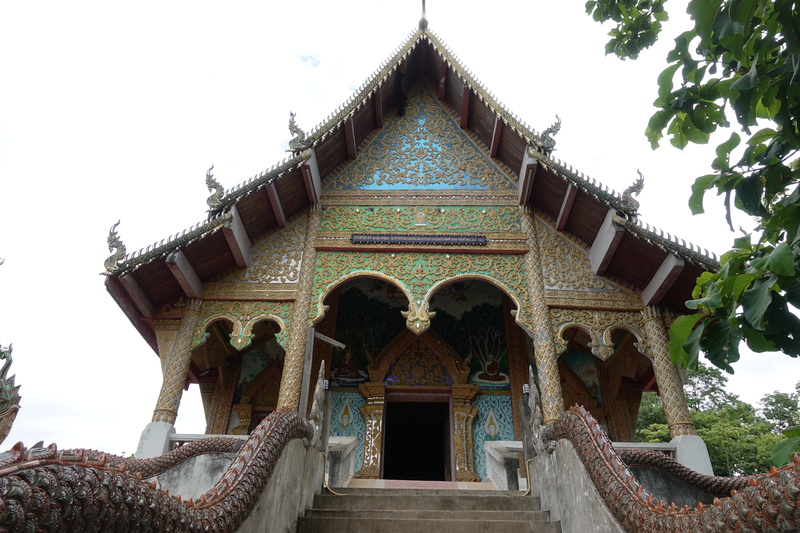 Some other cities like Chiang-Mai were also at some point “capitals” of some other disappeared or states that would merge together. 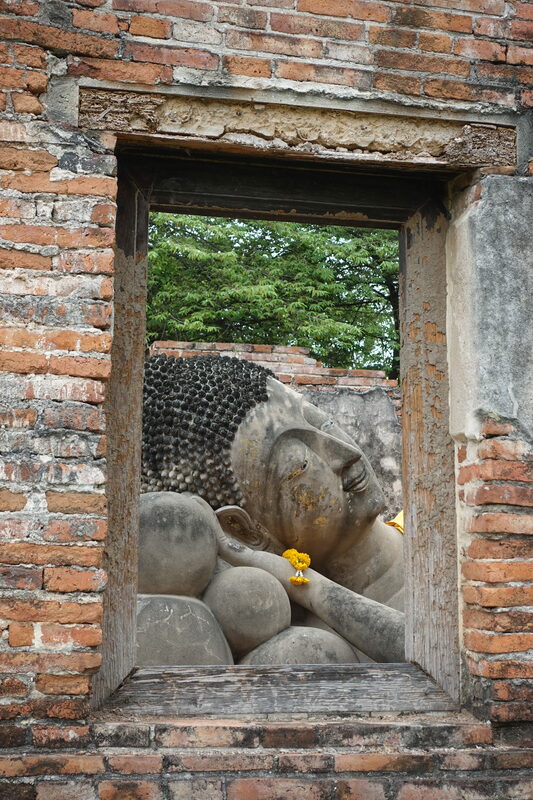 Just like in Europe, borders have moved a lot over the last centuries in south-east Asia, and that can be seen in the different ruins. 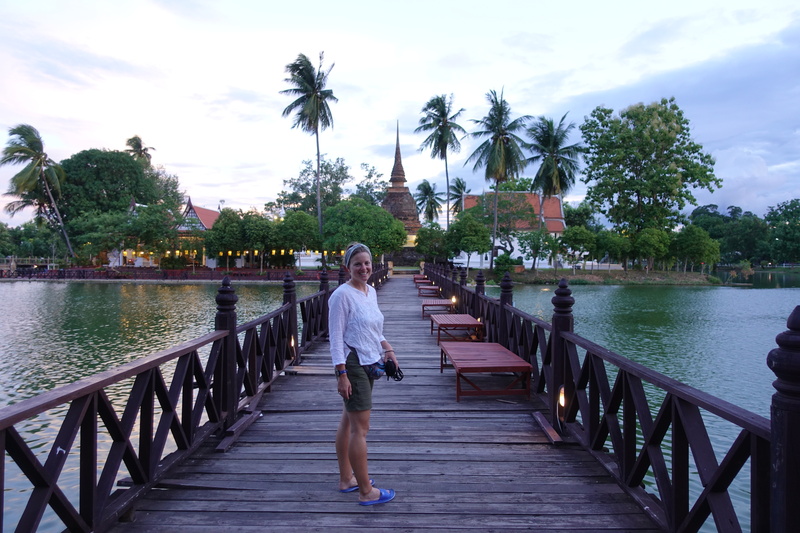 The day ended thus at a hotel in Sukhothai for another day of visiting the ruins and rest. 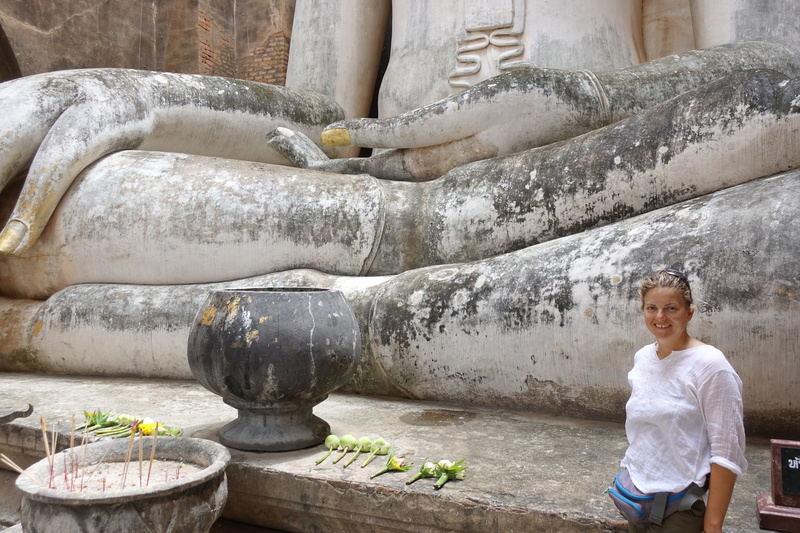 Much like Ayuttaya, we wandered from an ancient temple to the next one and enjoyed to freely visit the different spots, yet always under the sight of Buddha statues! 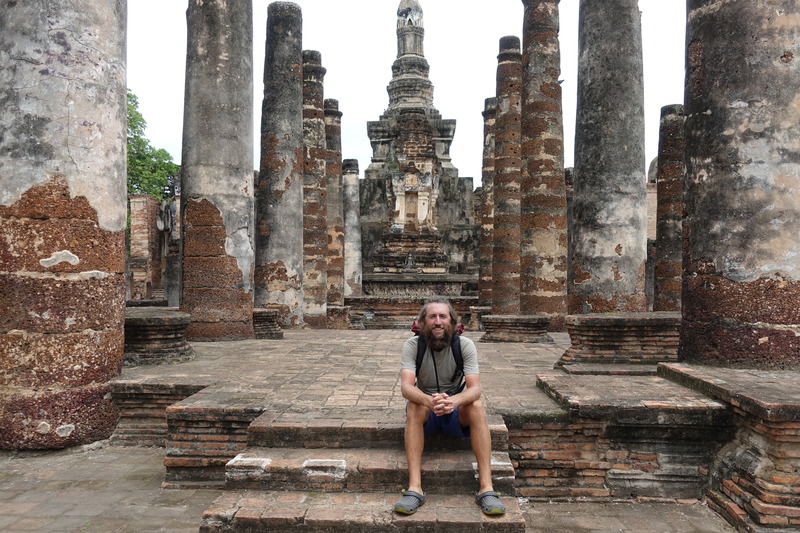 Leaving from Sukhothai the next day, our final goal was in reach. 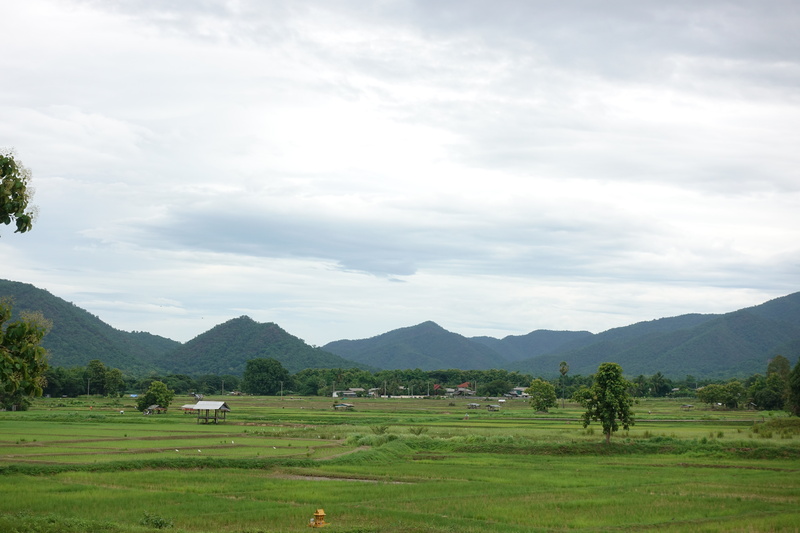 We could also see some changes in the landscape, from absolutely flatland since Bangkok, some hills and mountains in the back started to appear. 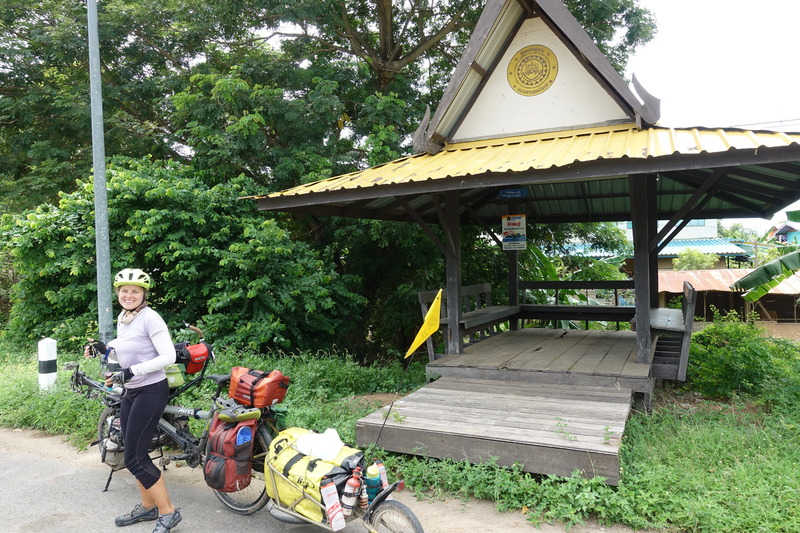 The day rides from Bangkok were constantly flat – almost amazingly as we had 80km days with only 30m ascent (so small that this would be almost impossible to find anywhere else, a single bridge can often be higher!) – and we would need to change gears for the first time in weeks. 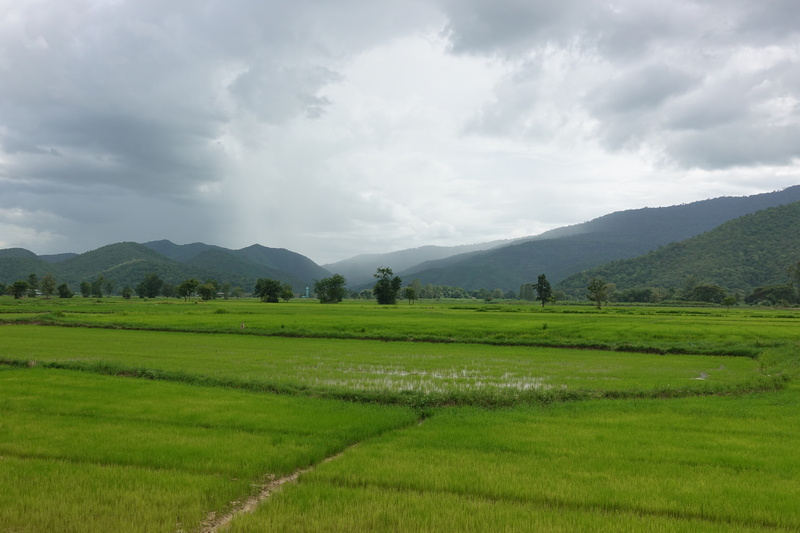 We took some back roads between the “Mae Wa” and “Si Satchanalai” national parks, where rice fields give way to jungle on the steeper grounds. 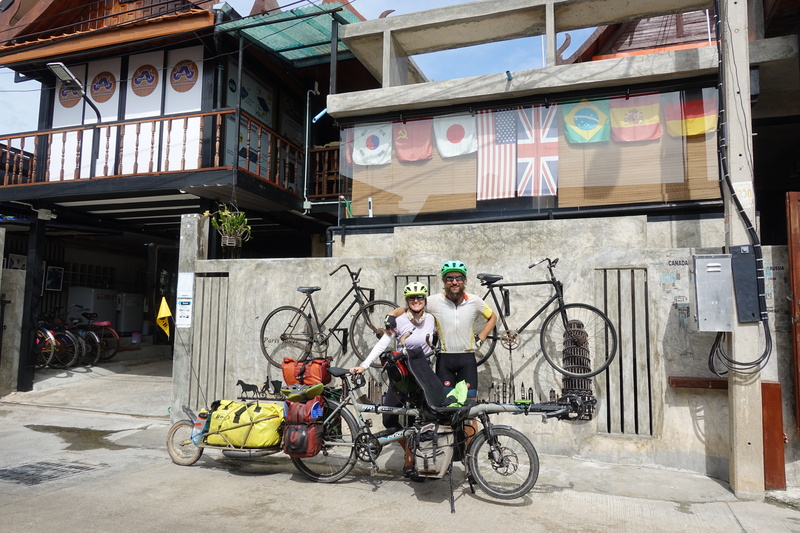 We met our first couple of cyclo-tourists in weeks on that road, but they were not too interested in talking to us (or to each other either apparently – we seem to be better at maintaining a good mood). 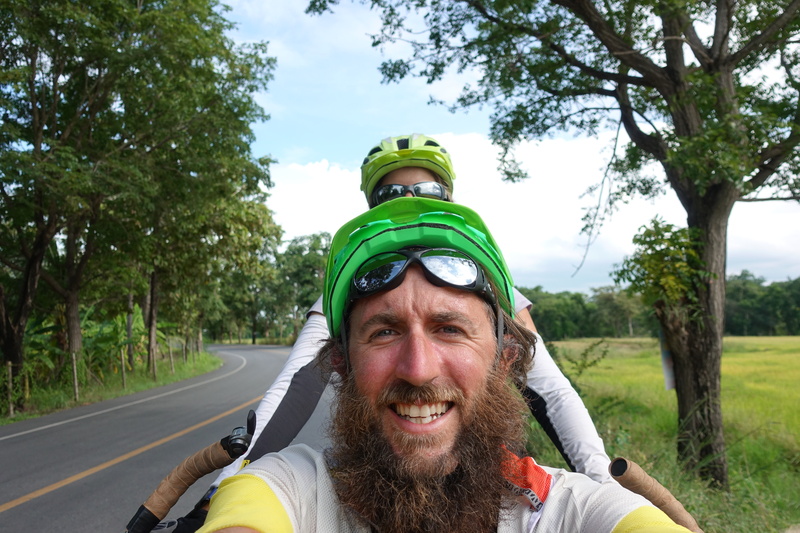 From Thoen, instead of taking the direct highway to Chiang Mai, we followed a road that would go through a mountain pass that a lot of Thai had told us was “very steep and difficult for cycling,” but was a pleasant smooth soft incline gently winding up to 700m over 30km. It sure is massive compared with the plains, finally some entertainment for us! 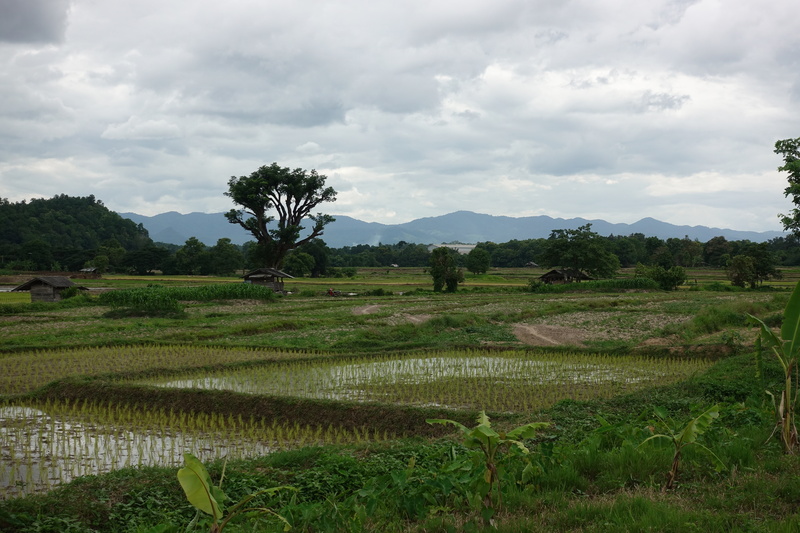 Other side of the mountains in the old Lanna kingdom – okay, there is still rice, but also a few other crops in-between! 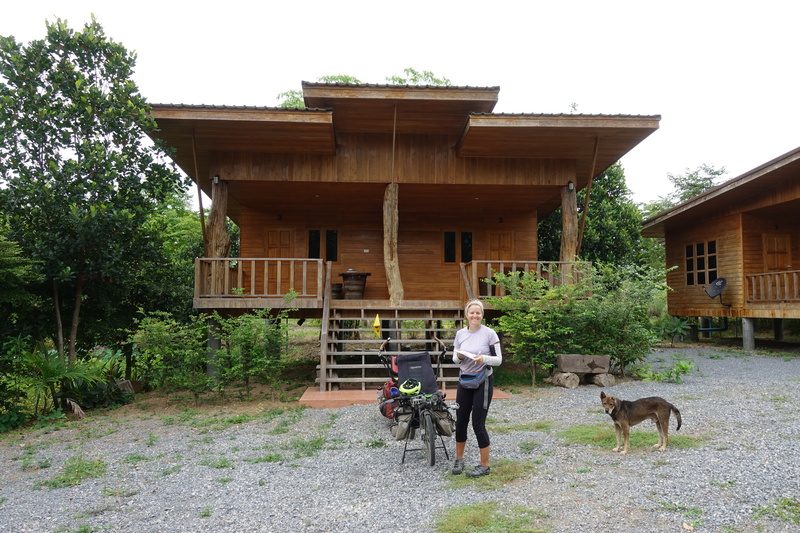 Chiang Mai meant again being back into city hazards, although nothing compared with Bangkok, and we settled in a low-key quiet hotel with the plan to take a break from cycling for our last week in Thailand. 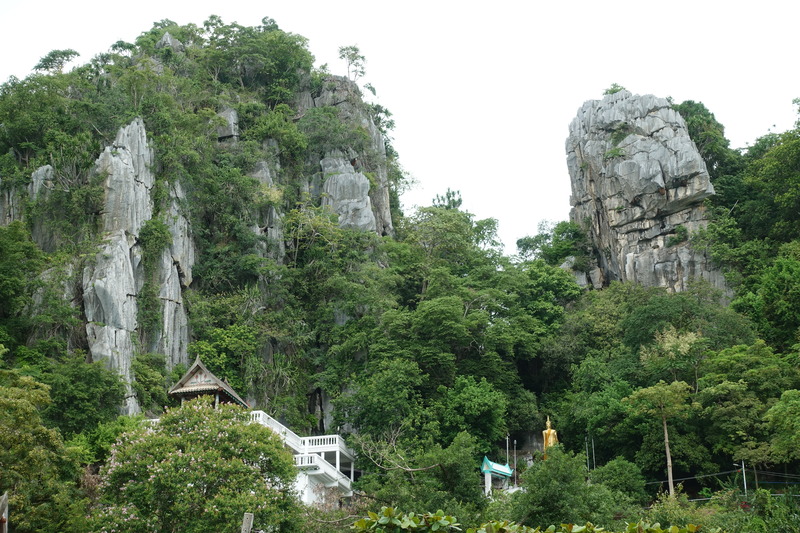 Looks much more attractive than Bangkok. Glad that Cedric is getting better and better.